A friend on Twitter asked me not long ago how I would rate “ease of use” as she needed to make a case to her managers of the severity of a product’s issues she is working on. She knew “good, bad or average” wasn’t informative enough, so I shared with her how I analyze product features and UI components and thought this might help others too. Some of our ux (user experience) terms require context or they are too vague to be meaningful. 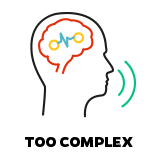 To begin with, eliminating terms like excellent, average or poor and using terms like intuitive (but more on that in a minute), learnable, teachable, non-intuitive or complex might bring us closer to understanding the reality of our experiences. Let’s define these words, starting with our first vague term: usable. How can I tell if something is usable? Everything is inherently usable by someone, even if the experience is miserable. Very few sites, apps, buildings, kiosks, vehicles or product packaging are technically unusable by 100% of the people interacting with them. True story: recently I accidentally turned on my emergency lights while driving home from Greenville to Atlanta and I could NOT figure out where the button was that I had pushed to make this happen. I looked high and low while driving, focusing a lot on the left side of my xTerra and just couldn’t locate it, which was embarrassing and made me feel stupid going down the highway. I got home and still couldn’t find it to turn them off and finally just started pressing things on the dash and console area and there it was… a giant button with a not-intuitive-to-me icon on it near the temperature controls. So is the button usable? Sure – the lights turned off and on and it is quite a large button any finger can press easily. But some would find the placement more helpful than I did, having always had emergency handles and buttons on the left-hand side of my vehicles. The best way to determine usability is to do user research, but even with research informing your designs and redesigns, aspects of your experience won’t always be usable to everyone, because your audience is rarely so perfectly defined that there aren’t varied backgrounds among the users. 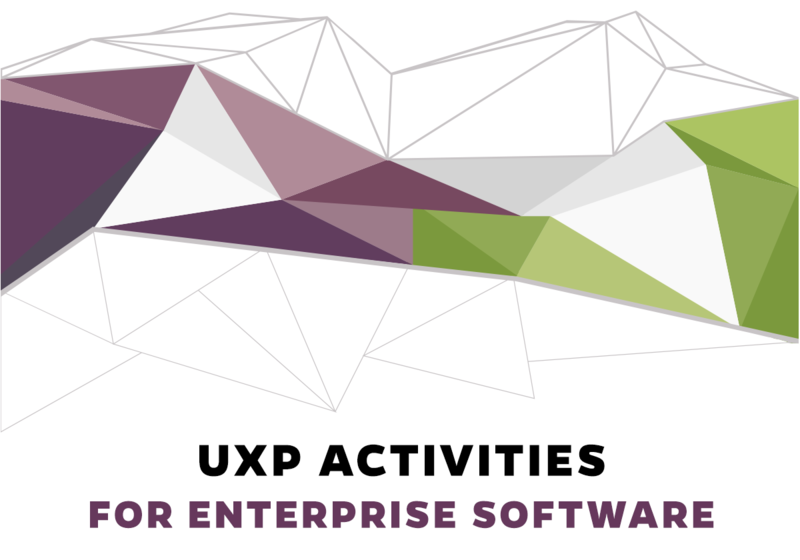 So when assessing whether or not something is usable or offers ease-of-use, some additional terms matter relating to your UI components, task workflow and language. Intuition is dependent on a prior experience. 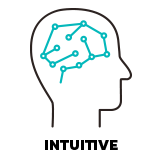 Intuitive is one word we UX designers love to use. 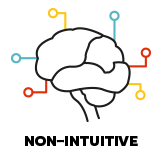 We want to be so brilliant in our approach and conduct such awesome research that the end result is so intuitive the user doesn’t even need to read! (I am only sort of joking.) Unfortunately, whether or not something is intuitive carries the caveat of it being so to a very specific audience. For example, the iPad is not intuitive to my Mother like it is to me. The iPhone and iPad are intuitive to me (now) because of memories in my conscience and subconscious of how various patterns work in these devices, but my Mother lacks those memories. Any little notice that pops up, or inability to get to Facebook like usual is a major interrupter as she just doesn’t have experience with how the UI works and what the words in the messages that popup mean. Is her iPad easier than her laptop? Sure, in some ways. But not so easy that help is not needed constantly. To boil this gray area down to simple terms, intuitive experiences rely on pattern recognition. For Mother, the iPad and her Android smartphone are non-intuitive, which means there is little or no pattern recognition and so many unclear or unguided options, the user has no clue what to do first, next or when a problem interrupts normal use. You need to examine your software (or sites, physical experiences, etc.) from the standpoint of what is not intuitive, so you can create guiding text, signage, interactive aids or other devices to help people navigate through the non-intuitive areas to keep them moving, while you continue working on improving anything that poses a stumbling block to your users. Make your experience easy to teach and learn. 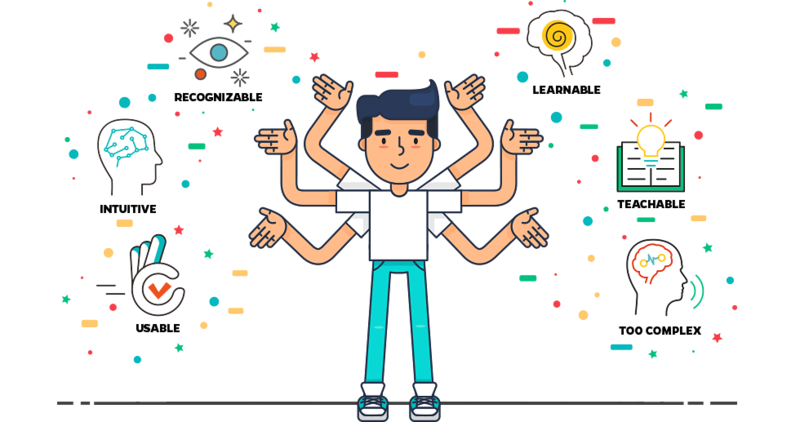 Given the issue of a diverse audience using your website, device app or software, I like to assess how teachable and how learnable an experience is. This can also be applied to physical experiences like navigating an airport terminal or using a television remote. 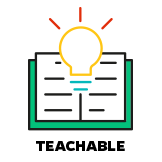 Teachable means there may be some steps to get through but teaching the user is fairly smooth & the process is logical, so that the user is able to reasonably quickly comprehend the task and the flow, whether going through some online learning you create or being taught by an instructor or corporate trainer. Learning how to use the product/site should become enjoyable as users master their new skills and basic functions should not be too complex. There’s no shame in aspects of a software application requiring instruction, and it doesn’t always mean you have a bad design. 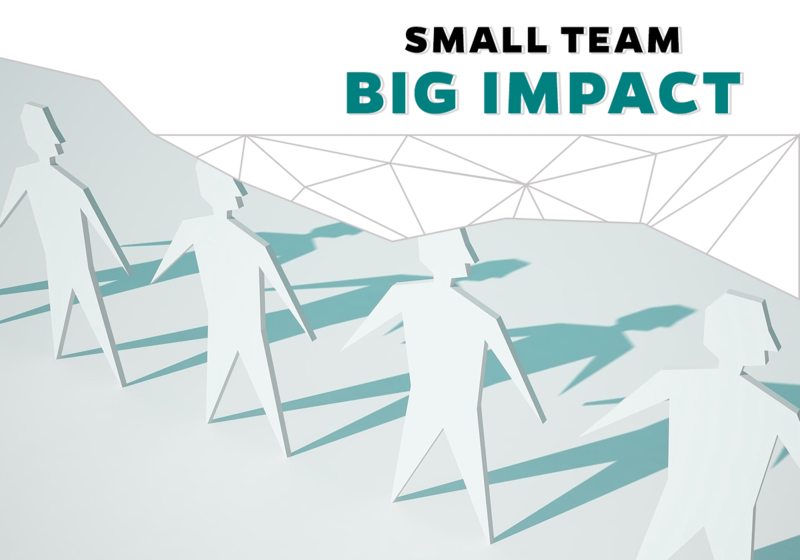 New ways of doing things or advanced processes that aren’t done daily may be harder to retain in memory and initially require help from an instructor or coworker to help understand if they are new to the task. 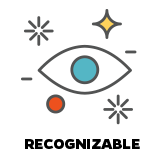 But if you find yourself rating 65-80% of your app or integrated suite “teachable” this is a warning signal you need more investment in ux research and design to improve it. 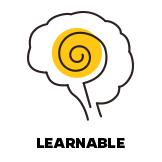 Learnable means there may be some hiccups in initial performance but once learned, it’s very easy. An example would be having a pencil icon to edit and a trash icon to delete a table row. Using the icons cuts down on screen text that has to be read, and once the user has figured this out the first time, it is easy to recall and do again. We all have memory associations – I like to call them memory hooks – and these are usually a factor when a user is able to learn how to use your product on their own, find something in a data-intensive site, or purchase something from an ecommerce store. The goal of an interaction being learnable should be in 1-3 trial and error attempts the user can now do this routinely without thinking about it. Think about people standing in line to ride a roller coaster at a large park, or the security check line at the airport. In some ways if a lot of people are in line already, it is easier to follow the crowd as you comprehend the flow, than to be the first and only person in line. This experience of watching and mimicking others is a blend of teachable and learnable by example. There seems to be a trend of not offering app Help, FAQ’s, or guiding screen text, but I have found careful labeling as well as small bits of leading text is the fastest, most successful way to help users teach themselves how to use a product. 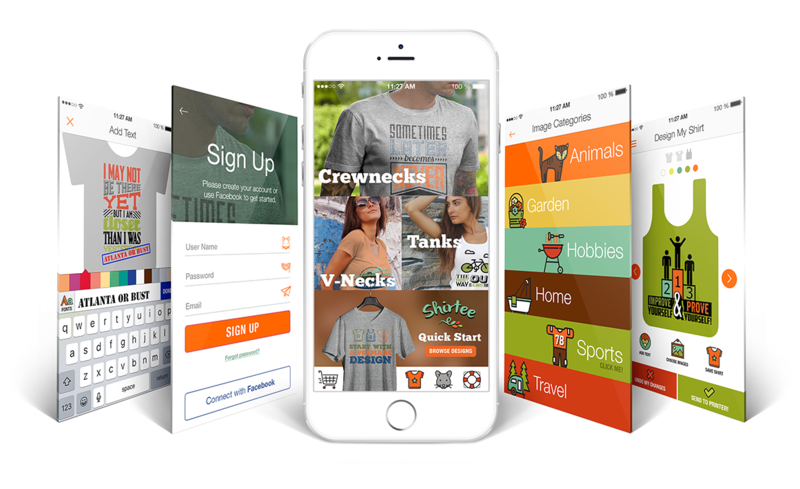 Invest time in site and app taxonomy to make it consistent, clearly written for laypeople, and easy to find and you will probably decrease support calls and user complaints. The most important thing you can do to make something more usable: scrutinize the complexity of everything you create. Sometimes, a product that did not have someone like a good ux designer or information architect involved from the beginning becomes too complex. The majority of my time spent designing a product or website is in the arena of simplifying screens and information to avoid complexity. This includes layout choices, navigation, guiding text, hover text information, making sure help/faq’s are available and working on the language used to describe things on the screen. The majority of enterprise apps especially have WAY too much screen clutter, and all of the extra text and fields to consume visually distracts the user from the task at hand. Screen clutter and language used in an app are where I can usually make big usability gains fast just by cleaning this stuff up. Another way to assess your products or sites is using “The 5E’s”: Entice, Enter, Engage, Exit and Extend. If you have marketing-driven apps or sites you may want to look at this approach – it has gained popularity and though not a direct measurement of usability, definitely has experience impact and these are good questions for your team think about:The 5 E’s of the Customer Journey. Whatever terms you come up with, ongoing analysis of the project you are working on in addition to user feedback is needed. The reason you can’t go by user feedback alone is because they aren’t UX designers. I have had users smile and tell me very plainly there is nothing wrong with the apps they use, having just copied and pasted the same thing into 4 different systems. Or after telling me an application crashes or boots them out at least once a day. It’s up to us, the user specialists, to define what is a mediocre vs. smooth experience. 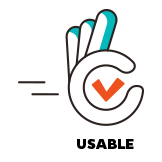 What terms do you use to help you assess the usability? Let’s discuss!